A s consumers, protecting our data, our funds, our safety, and our rights can feel like a full-time job. Fortunately, there are multiple agencies and organizations who are tasked with taking some of the burdens off of us through education and advocacy. One such agency, the Federal Trade Commission, hosts an annual, week-long event aimed at providing consumers with information they need. National Consumer Protection Week, held this year from March 4th through 10th, encompasses many different areas of need for consumers. Some specific areas that the Identity Theft Resource Center focuses on during this event are personal data protection, scams and fraud attempts, and identity theft. Consumer protection starts with the consumers, so it’s important to arm yourself with information. One of the best ways to do that is to sign up for the ITRC’s TMI Weekly. This emailed newsletter stands for Too Much Information, but in this case, they’re asking, “Are YOU sharing too much personal information about yourself?” It’s filled with the latest scam alerts, data breach news, legislative news concerning your data, and more. Phone scams are a rampant problem because they are so easy to commit. Autodialer software has made it possible for scammers to call random numbers without having to lift a finger. The use of recorded messages also means they don’t have to do any work unless a person falls for their tactics. Of course, phone number spoofing technology lets them harass people, even those who registered on the National Do Not Call Registry, without fear of reprisal. Make a deal with yourself: if you don’t know the number or you don’t know anyone in the city listed on your caller ID, don’t answer it! If it’s important, they’ll leave a voicemail. Important Note: If the voicemail claims that you’re in trouble with the law or the IRS, it’s most likely a scam. When it comes to your email, there’s a much bigger threat lurking in the shadows of the code. Clicking on links, opening attachments, and responding to the sender are just a handful of ways your computer or smartphone can be attacked. When you receive an unexpected or unusual email, even one that looks like it comes from a real company, ignore it and verify its information for yourself. Spring cleaning is hardly anyone’s favorite activity, although it does feel good to spruce things up and clear out the cobwebs. The same is true of your mobile devices and other technology. Clearing out any old apps you don’t use can not only free up space and prolong your battery life, they can also get rid of potentially vulnerable software that might be leaking information about you. There are a number of resources you can turn to for information and support, but safeguarding your identity begins with you. Remember, if something alarming should happen, the ITRC and the FTC are here to help. 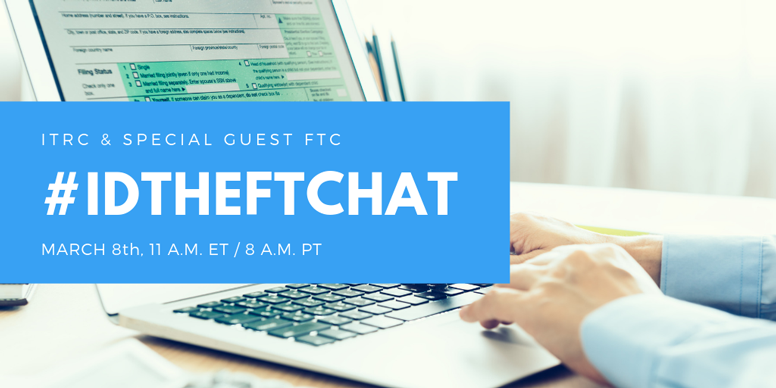 Join @FTC and @ITRCSD on Twitter for a chat about how you can protect yourself against tax identity theft this tax season. Follow along using the #NCPW2019 hashtag. https://www.idtheftcenter.org/wp-content/uploads/2018/06/32smWideLogo_edited-1-300x71.png 0 0 Charity Lacey https://www.idtheftcenter.org/wp-content/uploads/2018/06/32smWideLogo_edited-1-300x71.png Charity Lacey2017-03-06 20:12:462019-03-04 12:17:10It’s National Consumer Protection Week!